M. Valerius Messala was one of the moneyers for the year 53 BC. 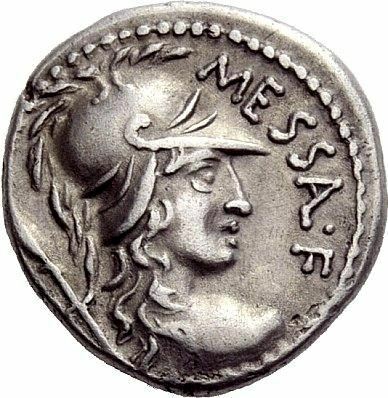 He was the son of Marcus Valerius Messalla Rufus, who was consul in 53 BC. Gens Valeria was a patrician family at Rome, prominent from the very beginning of the Republic to the latest period of the Empire. A number of unusual privileges attached to this family, including the right to burial within the city walls, and a special place for its members in the Circus Maximus, where the unique honour of a throne was granted them. The house built by Poplicola at the foot of the Velian Hill was the only one whose doors were permitted to open into the street.